Oops, we ran this again. 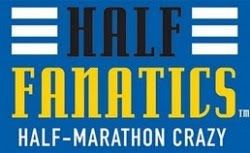 Here's a quick spoiler: every year at the expo for the Seattle Rock 'n' Roll Half Marathon, I sign up for the following year. You get a great price and, sometimes, even a free t-shirt. I have done this every year since the first year. But I didn't sign up for 2018. I didn't even buy the pint glass or the souvenir pin. I just got my bib and scampered out of the expo. I decided that 2017 will be the last Seattle Rock 'n' Roll I run. There. I've said it. It's not because of the new course -- a course ingenious because it's easy to take public transport to both the start and the finish, and super easy to take it between the start and finish. 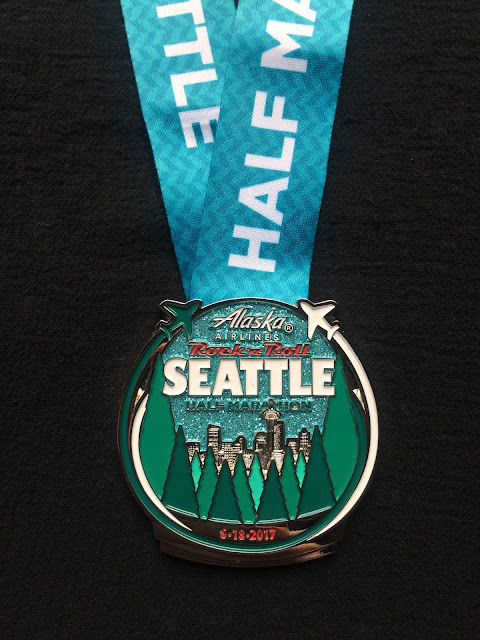 The course also managed to remove many of Seattle's hills, making it unusually flat. And there's a nice looooong stretch along the water -- very pretty. It's odd, of course, that it doesn't run through downtown Seattle at all -- though the full marathon does, a bit. And, unless you think of the stadiums as a "landmark" (and, no, I don't), you don't really get a feel for the city. But that's okay. It's not because I feel like there is less and less entertainment on the course -- and of course very little support out there. It's no different than most races I have run. It's the races with support that stand out as anomalies. It's not even because I no longer work for a running shoe company. Given that I actually ran less while working there than I did before, one might assume that I'd run more again. But I haven't. 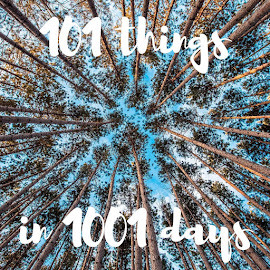 I guess it's because we do other things at the weekend now -- hiking, camping, etc. So now seemed as good a time as any to break up with the event. If I hadn't signed up a year ahead of time, I wouldn't have run in 2017. So there you go. But the race itself was fine, really. Wil and I took the bus to the start -- the only downside of the shift to Sunday was that there were so few buses running that would get us there for the 6:30 start. But it all worked out. The start was, as usual, a bit manic, with the corrals feeling more like "advice" than corrals, and little management or oversight as people shifted around. We didn't notice any security, but we also didn't bother to enter the "start village". We found our "corral" -- or at least a number associated with our corral -- and wriggled in. The starting line is waaaaaaay down there, past the pedestrian bridge. There may have been slight delay for the start, but it was nothing major. And it gave us time to take the requisite pre-race selfie. It was only as we got close to the start that a "corral rope" appeared in front of us -- while corral 13, or at least those who surged forward, moved to the start. But then, finally, our turn. We set off across the Montlake Bridge, which is always nerve-wracking to run across, with the spiky metal grating. Luckily I didn't see anyone fall -- unlike during both Beat the Bridge and the 520 Floating Bridge Run. Then a sharp left turn to enter the Arboretum via Lake Washington Boulevard -- always a gorgeous place to run. After passing the Japanese Tea Garden, Wil and I made a beeline detour to the bathrooms... finding them nearly empty but quite possibly the dirtiest toilets I have ever seen in the U.S. And, yes, that's saying something. I also managed to lose my sunglasses somewhere in this stretch. Then up and over the hill on Madison, a turn on McGilvra, and then back onto Lake Washington Boulevard along the lake. 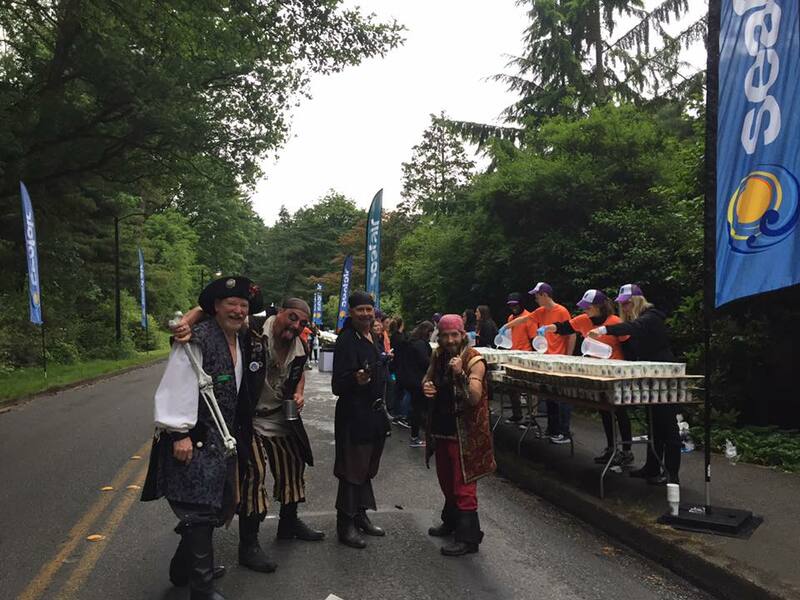 Somewhere along here we passed the Seafair-staffed water stop, where the pirates called out to the runners and offered rum. THEY WERE LYING. Never trust a pirate. As we were starting the long stretch along the lake, we passed a set of signs designed like old Burma-Shave signs -- to be read in little snippets as part of a longer message. But individually, they were just funny. Eventually, we reached the "Blue Mile" -- which is always moving. This year the memorial signs and photos came first -- I worried I hadn't noticed the first ones, as I was looking out for the flags. But there they were, so many of them. And then came the flag-bearers. This stretch always makes me choke up. I was on the far side of the road, but loved watching a runner go the whole way offering handshakes and high-fives to every flag bearer. I should note that we had long since stopped running. I think we managed to run-walk until mile 5, but then were both feeling done. Largely because the 6.5 miles we ran at Tinker Bell were, essentially, all the running we had done in 2017. But walking? Yeah, we've done that. So we just chugged along. Amusing aside: the following weekend we went up to the Greenwood Car Show, and Wil wore his Sonics jersey again. A guy came running over to high-five Wil, saying, "I just wanted to let you know that I ran the last 10 miles by you -- I used you as my pacer!" Poor guy, he must have had a slow race, too! By the time we turned away from the lake and back toward downtown, we were already past mile 8. We crossed to Rainier Avenue South via Genessee, rejoining the marathoners who had split off to run a little loop around Seward Park. Then down Rainier Avenue to Dearborn, then across to the stadiums. We again had to run up that funny "corkscrew" street, where Wil spotted the Hash House Harriers and we crossed over for a tiny glass of champagne. Then down the ramp at Royal Brougham and a right turn onto Occidental, where we passed the 13-mile marker, shouted "GOD SAVE THE QUEEN! ", and held hands as we ran down to the finish line. Our time? A new non-injured PW of 3:01:59. Did I mention that we were scheduled to go on a 4-hour hike that day? We simply hadn't gone slowly enough!!! We got our medals, a bottle of chocolate milk, and then decided, on a whim, to try the free Michelob Ultra offered at the end. We both took a few sips, looked at each other, and then dumped them out and threw the empties into the recycle bin. Yeah, that was so Seattle! We then decided to walk from the stadium up to T.S. McHugh's -- a bonus 2.5 miles. Don't worry, we did stop in the restrooms at the Seattle Center to get a teensy bit cleaned up. Why (besides the obvious reason), did we walk up to McHugh's? I had noticed in the "runner perks" section of the Rock 'n' Roll website -- a section I rarely bother to look at -- that McHugh's was offering to buy every runner's first pint. It seemed rude to decline.